Turbo 极速蜗牛 (USA,2013) - 英语电影角 - 英语交流吧论坛 - Powered by Discuz! 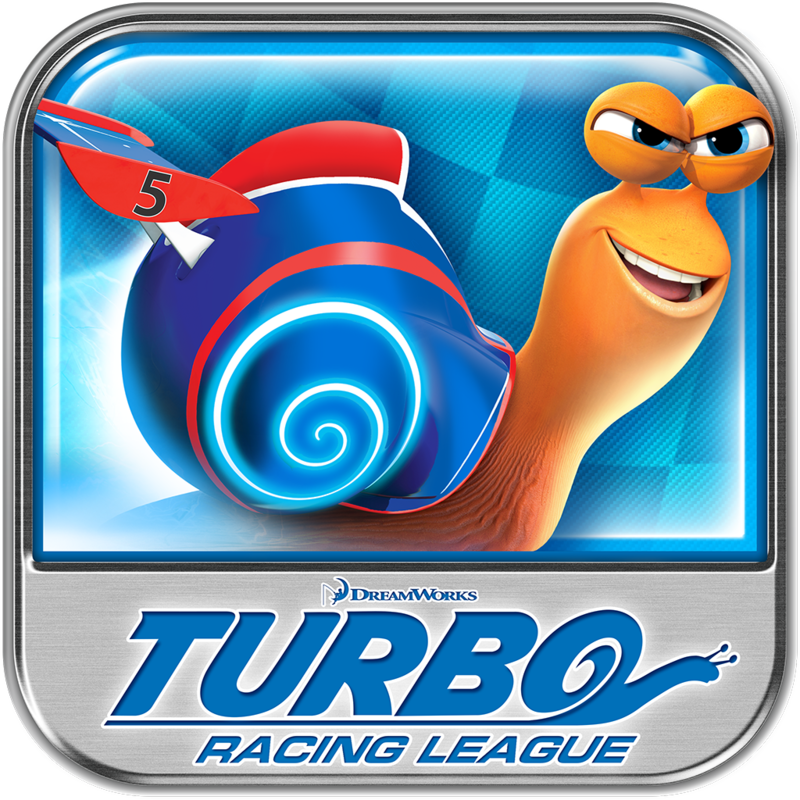 Theo, later referred to as Turbo, is a snail who dreams of being the fastest, best racer in the entire world. Due to his passion with speed, he is somewhat an outsider in his community. One day, he accidentally gets caught in a freak accident, which results in him having super-speed. His dream comes true when he gets in nitrous oxide during a street race, and now has the power of super speed. He is the main protagonist. 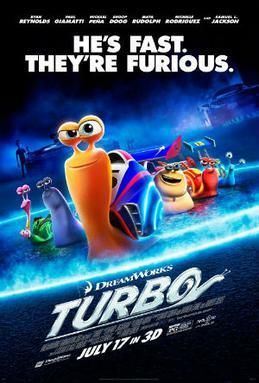 Turbo received generally positive reviews from critics. The review aggregator website Rotten Tomatoes reported a 67% approval rating with an average rating of 6.1/10 based on 101 reviews. The site's consensus reads: "It's nowhere near as inventive as its off-the-wall premise might suggest, but Turbo boasts just enough colorful visual thrills and sharp voice acting to recommend as undemanding family-friendly fare." Another review aggregation website Metacritic, which assigns a normalized rating out of 100 top reviews from mainstream critics, calculated a score of 59 out of 100 based on 26 reviews. The film earned an "A" from general audiences polled by CinemaScore, and an "A+" from audiences under age 18. A.O. Scott The New York Times gave the film three out of five stars, saying "Even in the absence of originality, there is fun to be had, thanks to some loopy, clever jokes and a lively celebrity voice cast. "Betsy Sharkey of the Los Angeles Times gave the film three and a half stars out of five, saying "Honestly, they pretty much had me at "racing snails." Linda Barnard of the Toronto Star gave the film two out of four stars, saying "Turbo's colourful trek to product placement-littered Indianapolis is as rote as it gets, but little viewers won't care about predictability." David Hiltbrand of The Philadelphia Inquirergave the film two out of four stars, saying "Let's face it: Kids aren't a very demanding audience. If there's color, movement, and a high quotient of silliness, they're happy." Peter Hartlaub of the San Francisco Chronicle gave the film a negative review, saying "After the originality of the hero, the filmmakers borrow too heavily from other movies; the similarities to Ratatouille and Cars are almost distracting." Laremy Legel of Film.com gave the film a 8.5 out of 10, saying "Turbo" is the sort of film that should work extremely well for folks who are interested in it. It lives up to expectations, even often exceeding them, though it’s a shame it’s unlikely to find much of a cross-over audience." Moira MacDonald of The Seattle Times gave the film three out of four stars, saying "Ultimately, "Turbo" nicely lives up to its diminutive hero's credo of, "No dream is too big, and no dreamer too small" - a pleasant thought, for people of all sizes." 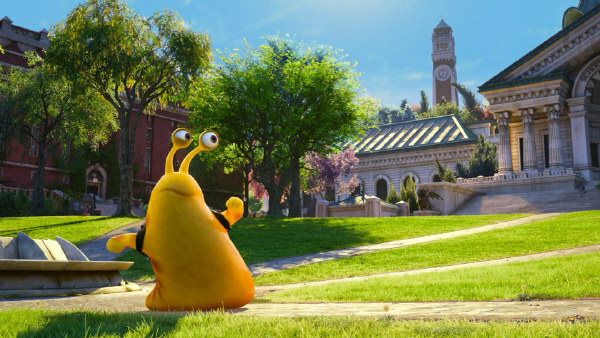 Joe Neumaier of New York Daily News gave the film three out of five stars, saying "Families who have already raced to “Monsters University” and “Despicable Me 2” will find “Turbo” an acceptable third-place finisher. A sort-of escargot-meets-“Cars” adventure, it has some sharp vocal turns and remains fun even when its inventiveness runs out of gas." Jen Chaney of The Washington Post gave the film two and a half stars out of four, saying “Turbo” is a derivative but nevertheless good-hearted movie that’s peppered with enough clever touches to engage adults as well as moviegoers of the smaller, squirmier variety." Tom Russo of The Boston Globe gave the film two and a half stars out of four, saying "While Disney seems to actively court entertainment headlines every time it gives us a new princess of color, here there’s no fuss, just a fully realized cartoon world that happens to be made up of the places and diverse faces found around an urban strip mall." Colin Covert of the Star Tribune gave the film three out four stars, saying "Turbo" isn't a perfect cartoon, but it's so likable that, like its humble hero, you have to root for it." Todd McCarthy of The Hollywood Reporter called the film "An attractively designed but narratively challenged, one-note film." David Fear of Time Out gave the film two out of five stars, saying "All Turbo does is give Reynolds, Paul Giamatti, Samuel L. Jackson and Snoop Dogg the easiest paychecks they'll ever make, and its corporate overlords the chance to sell a few toys." Nell Minow of the Chicago Sun-Times gave the film a B+, saying "The movie gets a bit slow, with too much time spent on the human characters, who are dreary and underwritten, compared to the big dreams of the little snail. But the film picks up when the racing snails come back onscreen, thanks to the adorable character design, with expressive use of those googly eyes, and especially to the voice talent." A.A. Dowd of The A.V. Clubgave the film a B–, saying "For all its chronic familiarity, the movie has its minor pleasures, many of them visual. Though at this point it's basically a given that a new studio-animated movie will look good, Turbo often looks downright exceptional." R. Kurt Osenlund of Slant Magazine gave the film two and a half stars out of four, saying "As a film about social issues, and simply being yourself, it's commendably progressive, going so far as serving as a kind of coming-out story." In Venice, California, Theo, a.k.a Turbo, is a garden snail who dreams of being the greatest racer in the world, just like his hero, 5-time Indianapolis 500 champ, Guy Gagné. His obsession with speed and all things fast has made him an oddity and an outsider in the slow and cautious snail community, and a constant embarrassment to his cautious older brother, Chet. Turbo desperately wishes he could escape the slow-paced life he's living, but his one chance to live proves a near fatal disaster when he tries to recover a prize tomato and needs to be rescued by Chet. Demoralized, Theo wanders onto a freeway to admire the traffic and wishes on the very first star (which is actually an airplane light), "I wish...I wish I was fast". Suddenly, he gets into a freak accident when he gets sucked into the supercharger of a drag racer, fusing his DNA with nitrous oxide on a street race. The next day, when Theo wakes up from unconsciousness, his incident the night before finds himself vested with the power of incredible speed and accuracy, as well as some of the characteristics of an actual car, such as eyes that light up like headlights, and a shell that blinks red like taillights and makes car sounds and music from a radio. Unfortunately, Theo's first attempt to show this power off ends with him crashing a Big Wheel tricycle into the garden, getting himself and Chet fired from the garden crew. As the siblings quarrel, Chet is snatched by a crow, but is pursued and rescued by Theo at a run down strip mall where they are then captured by Tito, a "Dos Bros" taco truck driver and is brought to race with other snails. Theo astounds both human and snail alike with his speed and earns the respect of the snails, led by Whiplash, with his crew Smoove Move, Burn, Skidmark, and White Shadow, who have impressive skills of their own. Inspired by this extraordinary snail, Tito dreams to revive the strip mall with Theo as an attraction, and eventually with the help of the snails who manage to divert and strand a tour bus and drum up impressive business. At this success, Theo convinces Tito to try to enter the snail in Indianapolis 500 as a competitor. While Tito's brother, Angelo, still declines to support him, the neighbors agree to put up the entrance fee and accompany them to Indianapolis. Once there, Tito is refused entry into the race, but a chance meeting with Guy Gagné gives Turbo a chance to show off his speed which astounds the race track at the snail qualifying for the race. This impossible feat soon becomes a sensation on social media and the owner of the race gives in to the pressure, egged on by Gagné himself, to let the snail compete. However, the night before the race, Turbo is demoralized when his hero, Gagné, sneers at his attempt to race while Chet confesses that he cannot bear to see his brother endanger himself. Undeterred, Turbo enters the race the next day, but the dangerous racetrack and the far more experienced competition leaves him trailing in last place. At a pitstop, Whiplash and his crew give Turbo a vital pep talk, advising him to race like a car. Back in the race, Turbo realizes what they mean and uses his small size to maximum advantage with maneuvers around and under the competition that no human racer can emulate. 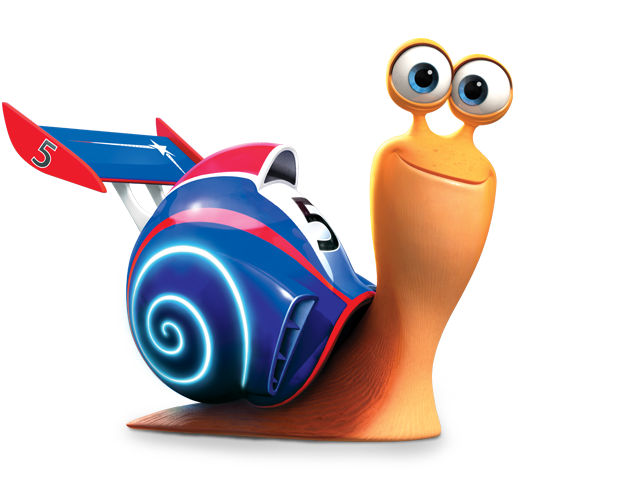 With the snail rapidly gaining in the standings, Gagné starts racing dirty and manages to knock Turbo against the circuit wall, damaging his shell and weakening his speed powers. Eventually, in the final stretch with Turbo in the lead, Gagné tries a desperate maneuver to beat the snail and gets into a major crash that snares most of the competitors in a major pileup. Similarly, Turbo is thrown, waking up once again from unconsciousness with his shell punctured and his speed all but gone. Alarmed at seeing Turbo giving up and retreating into his shell barely a few feet from the finish line, Chet puts himself into incredible dangers to meet up with Whiplash's crew to get to the racer. Seeing his brother and friends arrive riding crows to encourage him to continue, Turbo resumes the race. Unfortunately, Gagné, refusing to lose, singlemindedly pursues him by dragging his wrecked car after the snail and attempts to crush him. At the last second, Chet tells Turbo to tuck and roll into his shell at Gagné's last blow and the force allows him to tumble past the finish line to win. 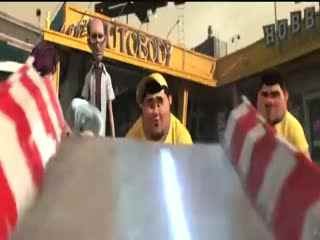 At this victory, the strip mall becomes a major attraction with all the businesses becoming spectacular successes including extremely elaborate snail races with Whiplash's crew getting special propulsion aids for their shells, while Chet is content as the track referee. As for Turbo, he becomes happier discovering that his shell has healed, and with that, his superspeed has returned. GMT+8, 2019-4-23 06:13 , Processed in 0.169034 second(s), 30 queries .